While making a hibiscus tea infused gin for my Wild Hibiscus Gin & Tonic I also spied my butterfly pea flower tea in the cupboard and decided to add that to my tea infused gin session. Butterfly pea flowers are one of nature's few naturally blue foods. They're also a little magic because when you add something acidic to blue pea flower teas or essences, they will turn purple in front of your eyes. I just couldn't pass up the opportunity for a color changing gin and tonic. 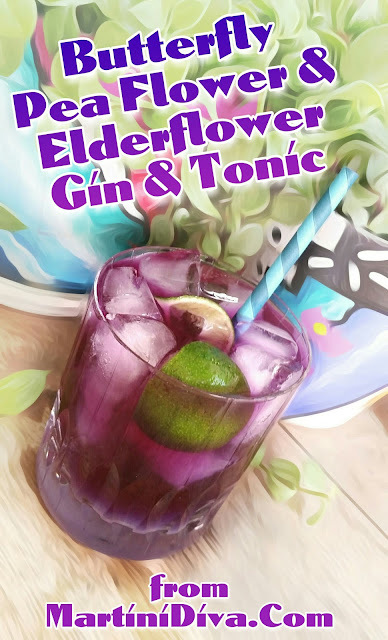 I also decided to add a bit of elderflower liqueur to amp up the elderflower floral notes of the Hendrick's Gin and to complement the pea flower, then I used a light lavender honey simple syrup to sweeten the drink. The final cocktail was a gorgeous, deep blue violet/violet cocktail that tasted like a floral, lightly alcoholic lemonade. It was amazingly refreshing and tasted like spring. DIRECTIONS * Preparation: An hour or two before serving your cocktails add one tea bag of Wild Hibiscus Butterfly Pea Flower Tea for every one and a half ounces of gin and allow to infuse, the longer the infusion, the stronger the flavor. Strain and set aside for the cocktails. ** Prepare the Lavender Honey Simple Syrup by combining 2 tablespoons of hot water with 2 tablespoons of Honey Ridge Farms Honey Creme Lavender then set aside to cool. For each Cocktail: Add the pea flower tea infused gin, the lavender honey syrup and the elderflower liqueur to a highball glass filled with ice. Top off with tonic water and stir. 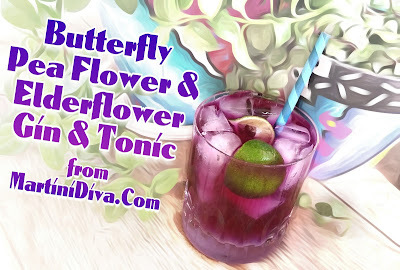 Slowly squeeze then drop in the lime quarters, the drink will turn from bright blue to deep purple just as you serve it.